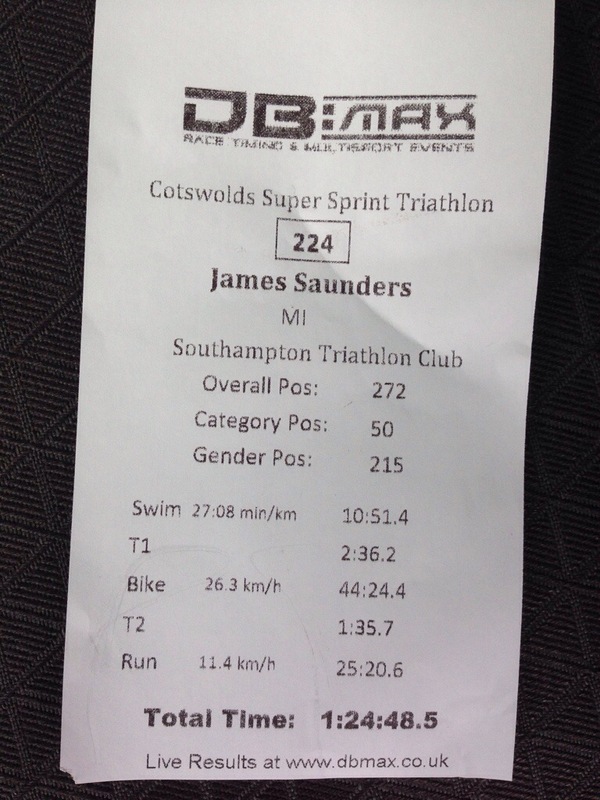 This morning I competed in my first triathlon of the year… the Cotswold Super Sprint. A little lax I know, but it’s been a little hectic over the last few months and rather than sign up for too many events, I’ve focused on a handful. Rather than get up before 5am, Chris Stocks and I decided to go up to Cirencester yesterday (Saturday), stay over in a Premier Inn (Swindon North) and then have a slightly longer lie-in before the event. It was a plan that worked well. Having got all my stuff together, I needed to tune my bike a little as on the last few rides, the gears have been a little jumpy and clattery (is that a word?!) I left this until Friday afternoon for some unknown reason and was worried that would mean that if I messed the re-indexing up, I may have to ride a bike with one (inappropriate) gear. However, having reacquainted myself with the simple art of indexing gears, I got my road bike out onto my workstand and went through the process. The fact that I’d left it so late meant that I didn’t have chance to ride the bike to check them but I was fairly confident they’d be ok… Gulp! Anyway… at 12:30pm I left home, filled the car with diesel before picking Chris up. I arrived a little early to find him protein loading with steak whilst he, Ali, George and Molly watched Sherlock. 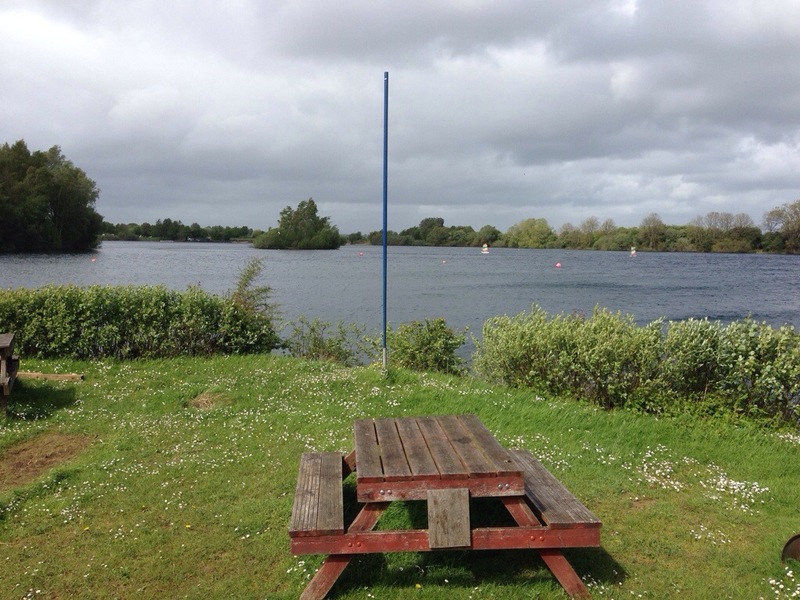 Having got Chris’ kit in the car, we started our journey up to the Cotswold Water Park and Beach, the venue for the triathlon. After about 80 minutes on the road, we arrived, parked up and headed to registration which had opened. Once we’d picked up our timing chips, race numbers, assorted flyers for local events and services and a tech T-shirt we went to recce the course. The swim was 400m and having spoken to a few other competitors, we believed we knew the swim route (we’d been given duff info and been told the 200m swim course instead which explains why the course we believed to be 400m looked rather short). Having looked at swim entry and exit (the latter required quite a climb up a steep bank), we went off to check out transition and also the cycle mount and dismount areas. As the ground was mostly gravel from transition to the mount line, the organisers had kindly laid carpet down to run on. There was some discussion about whether to keep cycle shoes on the bike and run barefoot but the consensus was to wear the cycle shoes from transition (T1) to the mount line and back from the dismount to transition (T2). On our recce of the mount/dismount area, we checked out a bit of the run route and decided that with the recent wet weather and rain forecast overnight that trail shoes would be best for the run. 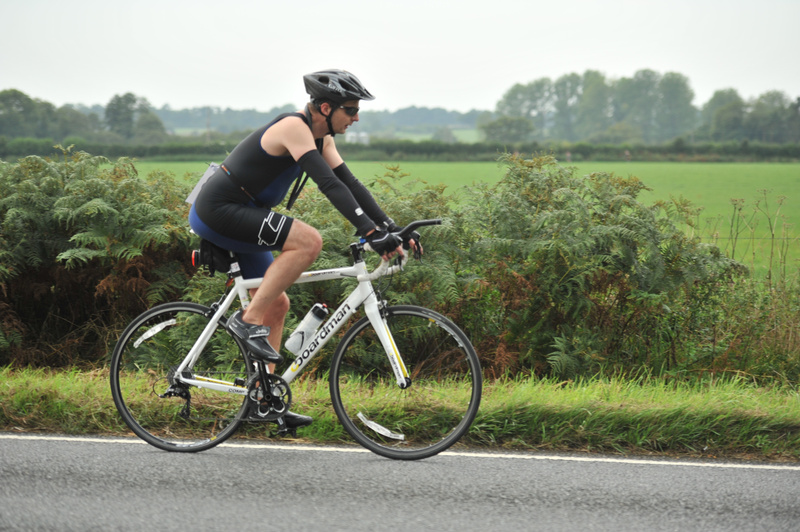 As well as sussing things out ourselves, we provided some advice to some first time triathletes. Once we were happy that we knew as much about the venue, transition, cycle mount/dismount as we were likely to find out we headed back to the car and decided to check out the cycle route. As we drove the course, we worked out where we’d get battered by the gusty winds that rocked the MPV as we drove along. Fortunately, the road surface looked mostly good and there were long sections which were well-sheltered by tree. There were a few sections that were more exposed that could prove a challenge if the forecast gusts joined us for the morning. Having obtained a good knowledge of the course and worried a little about a lack of signs, signs blowing around 180 degrees and one crossroads with limited visibility in any direction, we headed to the Premier Inn. After unloaded all our kit into the room and got organised for the following morning, we decided to retire to the restaurant/bar for a coffee and meal. As we ate, we talked about running, triathlon, family, fellow parkrunners, etc etc. For our meal, we tried to choose the healthiest option, Mediterranean Chicken, but then went for the crumble with custard as a reward for, um, er choosing a healthy main course!! As we finished our meal, we started to communicate with Ben and Chris (from Try Tri) and Ian Boshier who were asking about conditions and the course. At about 9pm, we headed back to the room ready for a (hopeful) good night’s sleep. After a (fairly) good night’s sleep which involved a fair amount of listening to the wind outside, our alarms woke us up at 5:30am. We had a quick breakfast of fruit and yoghurt (thanks Chris), took an energy gel and then headed to the lake. It was a 15-20 minute drive and we arrived to find the car park we’d hoped to park in full so got shepherded to an area further away. It wasn’t too much of a problem though particularly as I’d reduced my gear to a small rucksack and bucket. We unloaded our bikes and headed for the transition area to set up. Time flies when you’re setting up so it’s good to arrive early. As the racking was numbered, our bike positions were set and we didn’t have the luxury of finding an optimal spot close to the exit of transition. This wasn’t a major problem though as, although there was racking for about 500 bikes, the transition area was fairly small. Once we’d set up, we spotted Ben, Chris and Ian and had a chat. 3 great blokes and a pleasure to spend time at an event with them. With time ticking, we headed back to the car to get our wetsuits on and pay a last minute visit to the toilets. Not the first visit of course. We barely had time to get into our wetsuits before the announcements of the very imminent closure of transition over the tannoy so grabbed our goggles and swim hats and headed back at a jog. I dropped off my cycling jacket and we exited transition and headed for the swim start area to watch the first wave set off. Although, Ian, Chris x 2, Ben and I were in different age categories, we were all in the same wave, the 3rd to set off. We were called into the lake a few minutes before our start time of 8:13am to warm up. The water was crystal-clear. Amazingly so. I swam looking at the bottom and could make out the plants at the bottom of the lake really clearly. This was an experience I’ve not encountered in a lake in the UK before! At Lakeside, you can’t see 10cm beneath the surface! We were then called back to the edge of the lake ready for the start horn. HONK! We were off. I wasn’t sure how well I’d swim having not races in a lake since the HOWSC 100. However, I got into a rhythm and stuck to it. It was pretty congested at the start with lots of flailing arms and legs. The masts of the boats we were going to go around were easy to ‘sight’ and with that and the clarity of the water, swimming in a straight line was much easier than I’d been used to in previous lake swims. I managed to keep up with the main pack round both ‘buoys’ before heading back to swim exit. I didn’t know how well as was doing but knew it wasn’t too bad as I wasn’t trailing too far behind the pack. As I approached the bank, being able to see the bottom made it far easier to work out when to stand up and walk to the edge. As we had to negotiate the steep bank to get out, it was great to have 2 marshals to give us a hand out of the lake. My swim including the stumble/run to T1 took 10 minutes and 51 seconds. for 400m, I’d expect to take about 8 minutes tops so why so much longer? Well, I can put it down to swimming further than 400m. In open water, although you feel that you’re swimming in a straight line, for many of us, this isn’t the case and 400m can soon become 500m, 600m etc! Also, the time taken to get up and out of the lake and from the swim exit to T1 clearly adds time. As the Garmin 910XT uses GPS in open water and it only has the chance to get a fix on the satellite when the wrist with the watch is on is out of the water, the GPS tracking can be very eratic. In a pool as long as you swim in a straight line, you know that you’re swimming 25m per length (but, most likely, losing momentum on every turn). I ran into transition and passed Ian who had clearly had a good swim. I also spotted Chris S still preparing to get out on the bike. My swim clearly hadn’t been too shabby to see him in T1. However, due to the burst blister on my foot from last Saturday’s parkrun where I wore trail shoes with no socks, I wanted to put socks on before my cycle shoes. This would also help keep my feet warm. Unfortunately, in the rush, I didn’t put them on very well and that would cause me a problem later as you’ll (if I remember) read about that later. I put on my sunglasses, helmet, race belt, socks, shoes and cycling jacket and that caused my T1 to be pretty slow. I’m hoping to need less and be far quicker for Blenheim. I ran with my bike out of transition and off to the mount area. It was quite a distance but the ground was good (especially with the carpet). Just before the mount area, the carpet ended short and this meant I got some grit or similar on the cleat on the bottom of my right shoe sole. This would cause a problem when I went to try and clip in. I had a little trouble mounting the bike and even more trouble clipping in with my right foot due to the grit picked up on the run. Having tried a few times, I gave up and pedalled off having lost a few places. The choice of wearing the cycling jacket was definitely the wise one. It would have been pretty cold with the air temperature and chill from the blustery/gusty wind. The cycle leg went fairly well. It’s not a discipline I’m very strong at and that’s definitely something I need to work on. The course was easy to follow, well signed (more signage had been added after our recce) and well marshalled. I couldn’t have faulted it actually. It was great that the cycle course was one lap as it was gusty. Where Chris S and I had expected the gusts to cause a problem, they did. But, it wasn’t anywhere near as bad as I’d expected. The section through the industrial estate was fine with one last kick uphill before the descent/flat section back to the finish. Before very long, there was a green sign for ‘Cotswold Water Park and Beach’ and I knew that the dismount area wasn’t too much further past that. At said point, I dismounted, wheeled my bike through the narrow gateway back into the carpeted path back to transition. In T2, I racked my bike, swapped my shoes, took of my jacket and finally removed my helmet before heading out on the 2-lap run. Before 100m, I felt that my left foot was uncomfortable. This was the foot with the blister and it was clear that my hastily put on sock wasn’t on properly and likely to lead to discomfort around the 5km run course. I had to choose whether to stop and adjust or to carry on. I chose the latter. Before very long, Chris S came past me. For a millisecond, I wondered (hoped?!) that I’d somehow passed him in the bike leg and got out on the run before him but, in reality, I was overtaken on the bike by plenty of people and those I overtook were much, much fewer in number. About 1km into the run, Ben came by and at that point I knew that both Chris S and he were a lap ahead having completed their cycle (and swim) about 10-12 minutes faster than me. The course was flat and on a mix of grass and gravel with one short section through a car park. Trail shoes were definitely the right choice as the ground was a little damp in places. I completed the run at a pace that meant that I expected to finish in about 27 minutes. However, my run time was recorded at 25:20. A short course?! I was cheered over the line by Ben, Ian, Chris x 2 and we chatted before grabbing a hotdog and bacon roll. Overall, I was pleased with my performance in the event. I swam as well as I’d hoped. My bike leg was ok. I could have pushed harder but that may have compromised my run and the run was steady. I had set myself a target time of 1:25:00 and had beaten it. It’s difficult comparing different triathlons even when distances for each discipline are meant to be the same. Eastleigh Open Water Triathlon is also a 400m swim, 20K cycle and 5km run event so I’ll compare my performance last year of 1:31:17 to today’s 1:24:48. That’s a 6:30 minute improvement so I’ll take that. PS I’m happy to report that my gears were indexed beautifully!! 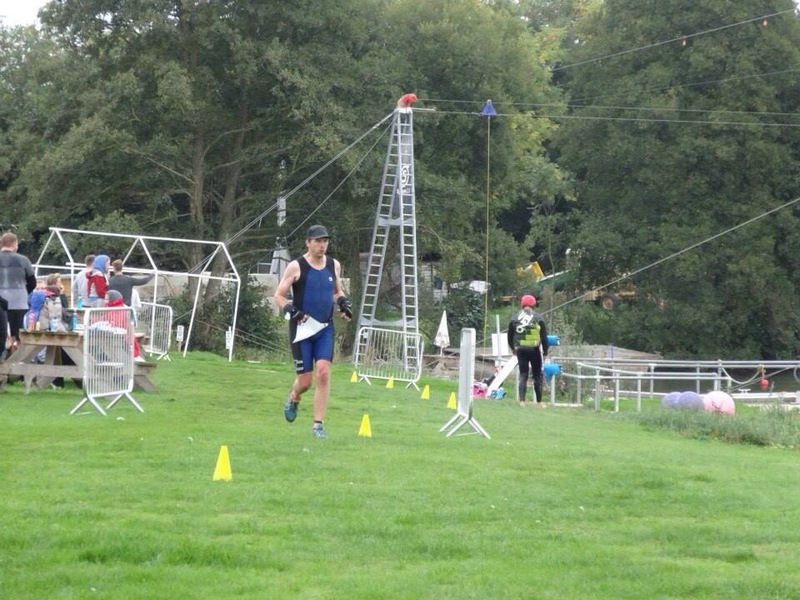 Next up Blenheim Sprint Triathlon in 5 week’s time. I wanted to squeeze a swim in but also wanted to get a run closer to my 100th parkrun. As the STC session at the Quays and parkrun both start at 9am, that wasn’t an option. Then I was reminded about the lake being open at Lakeside so decided that I’d do my first lake swim of the year and then go to Fleming Park for my 79th parkrun. Sorted. Later in the week, Denise asked what my plans were and I was then asked why I was planning to do both swimming and running to which I reminded her I was a triathlete and I’d be doing far more than a 1km swim and a 5km run in one day when I do the Challenge Weymouth Half Triathlon. I’m not sure that fact made any difference as I was told I was ‘becoming obsessed’. The thought that my cycling had been neglected was playing on my mind so I decided to address that too by cycling to and between the activities. I set to work on calculating distances. Rather than choose the easy 5km from home to Lakeside, I decided to go ‘the long way’ by heading down Allington Lane through Fair Oak and Bishopstoke. That would be a 12km route instead and I decided to cycle back that way too. With several triathlons this year, I had decided that last year’s approach of using a large see-through box and rucksack wasn’t the best way to transport my sizeable stash of triathlon equipment and certainly wasn’t a viable option for my plans on Saturday when I’d need swim, run and cycling equipment. I decided that a transition bag was the answer and that as I’d be cycling to Lakeside and then Fleming Park and finally home that the transition bag would have to be carryable on the bike. A little coincidence was that I’d seen a Blueseventy T1 Triathlon bag (Backpack) on a Facebook page so I did some checking around. For some reason Wiggle had the item discontinued but there were several other ecommerce sites selling it so I placed an order. As the lake was likely to be 12-14 degrees C and the air temperature was forecast to be about 3 degrees C on Saturday, I decided to purchase a thermal cap, gloves and booties. Although I’d probably not need all of these at any one session, having them in my equipment stash would be useful if the open water temperature dropped. Wiggle were in stock with blueseventy products to meet my needs so another order was placed. Ker…ching! Fast forward a couple of days and Saturday morning had arrived. All do-able and no need to rush too much. My transition bag was packed. It’s amazing how much gear is needed and it felt like I’d packed for a weekend rather than a morning. The transition bag has a 32l capacity and I’d filled it all with wetsuit, etc. I’d decided to wear my tri-suit with track suit trousers and a cycling jacket and keep the tri-suit on for each of the activities. At 6:30am I was on my bike and heading off for Lakeside. My original route was to get to Eastleigh and then follow Southampton Road directly to Lakeside but as I got to Eastleigh a Station I decided that to save time later, I’d add a little extra to my first ride and take a shorter route home. The plan was to still cover 24km in total. The ride to Lakeside was uneventful and I got there later than I’d planned due to the change of route to Lakeside. The car park was pretty busy and I spotted Ian Boshier’s van as I cycled through. Having locked my bike up outside the changing rooms, I signed in, collected my Try Tri lake swim pass and went to get changed. Having seen what everyone was wearing, I decided against the gloves and booties but decided to wear the thermal cap. There were several people there I knew as well as Ian including Ian Fearon, George Sellors and Sonia Rushby. Once I’d reached the edge of the lake, I was able to zip the back of my wetsuit up myself. That was the first time… ever that I’d not needed help. This was great news as it meant my weight loss meant the suit fitted me better!! Result. Having donned my thermal cap, it was time to enter the lake. This is always reminiscent of a zombie shuffle and was no easier than ever before due to the slippery surface underfoot. The water was cold but not too cold. My feet felt like blocks of ice from the chill of the ride and the fact I’d not worn socks though. The lake temperature was certainly not as cold as I’d expected and felt much warmer than the air temperature. I spoke to Ian B who’d done one lap already and then had a conversation about goggles with a couple of other swimmers (who else?) before starting my swim. As my face touched the water, the coldness took my breath away and I struggled with my breathing for the first 50m but knew this was a normal reaction. I’d forgotten to submerge to acclimatise. As I warmed up, I got into a normal breathing pattern (although not bilaterally breathing) and tried for an efficient stroke. On the 3rd straight of the lap, at the far end of the lake, the distance between buoys is its shortest but it always seems to take a long time to swim between them. I often wonder whether there’s an undercurrent!! I must say that the new yellow buoys are so much more visible than the purple gym/swiss balls from 2013! This makes sighting far easier and I felt than my path between the buoys was much straighter than previous swims. Having completed one lap (approx 350m), it was time for a rest and a chat with Ian, Sonia and Julian (who didn’t recognise me at first). While we chatted, Donna arrived at the side of the lake so I waited until she got in and had a chat with her too. As a quick aside, I have to say that the thermal swim cap was amazing. Although my face had got cold, my head wasn’t. In fact, I felt very comfortable and not even wet! Donna and I headed off for another lap (my 2nd) with Donna on my toes (I think!) On the straight back to the start, another STC member and I kept swimming across each other. All good practice for an event. Once we reached the start area, I checked the time and was a little undecided as to whether do another lap or get out. I decided to do another lap and that was uneventful other than forgetting to put my goggles on. Being back in the lake felt great. It’s not the cleanest or biggest open water swim venue but its location is so convenient. STC coach Steve likened it to a muddy duck pond and he’s not far wrong!! Having changed back into cycling kit and spoken with a couple of other triathletes about events, it was time to cycle to Fleming Park. I took the shortest route so I got there just after 8:30am. I caught up with Chris and spoke to several others. Sonia and Donna arrived just before 9am from their lake swim and Donna and I decided to have a leisurely run together. It was really nice to have someone to chat with without the pressure of trying for a PB. We crossed the line in just over 29 minutes and I spoke with a few more friends before changing into my cycling shoes and headed home. Not bad for a morning’s work especially as I’d also burned about 1600 calories which meant I could enjoy a guilt-free trip to Pizza Hut later in the day!! It’s customary to look back at the end of a year at achievements (and what you wish you’d achieved) but with December fast approaching, I haven’t got many more goals for the year so thought I’d look now. It’s probably been my most achievement-laden year to date particularly with regards fitness and related goals. 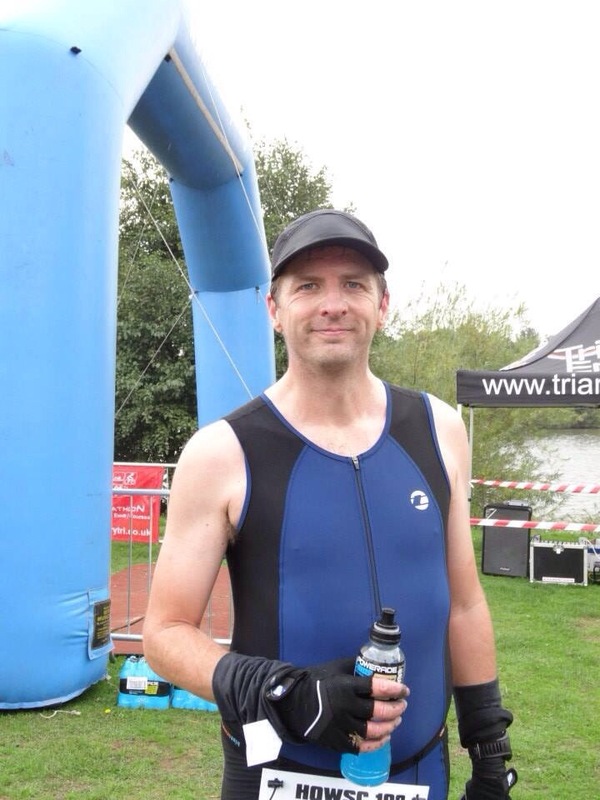 June 2013 – Completed my first Triathlon, the Eastleigh Open Water Triathlon. I loved it and went on to complete another 2 triathlons. I was also fairly active behind the scenes on the LRR 10K committee which was held on the same day. A great event. Also, held the 2nd Lordshill Mile Series event. July 2013 – Ran in the National Lottery Anniversary Run (not once but twice) and got to cross the finishing line in the Olympic Stadium for my 2nd and 3rd time. The 3rd time was extra special because I ran it with Daniel and Denise. September 2013 – Completed my 2nd Triathlon, the Valley Leisure Tri, and helped organise the 3rd LRR Mile Series event and got a mile PB. BOOM! Also, organised a Magic Mile singlehanded at Southampton Sports Centre and did my 30 day ‘cut the cr@p challenge‘. Also, became Vice Chairman of Lordshill Road Runners and joined a triathlon club, Southampton Tri Club. 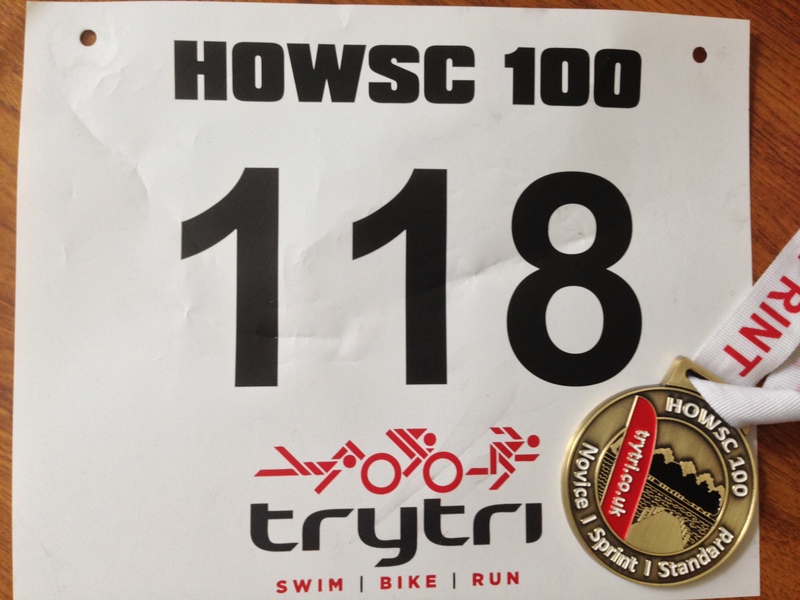 Finally, I completed my final triathlon of the year, the HOWSC 100 Sprint Triathlon. Add to all that about 1130km of running, 740km of cycling and 140km of swimming as part of the training for the events above (roughly 200 hours) and also helping to start Winchester, Queen Elizabeth and Brockenhurst parkruns (and now helping with 3 – 4 more in the local area – more about those in early 2014), it’s been a busy year. 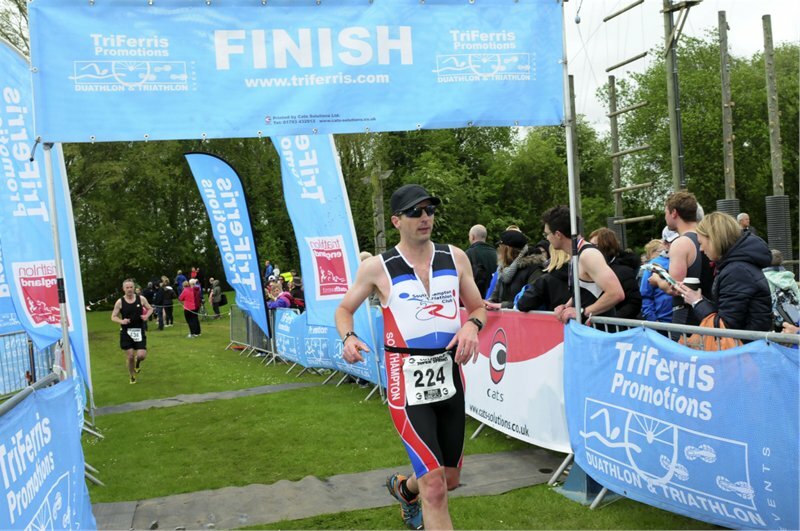 Having completed 2 triathlons so far this year, I decided about 3 months ago that I wanted to do another one before the year was out and fortunately, the team at Try Tri had one left in the calendar for 2013; the HOWSC 100 Triathlon. As with most Try Tri events, the distances are a little open to negotiation! The swim might have been a little longer and the bike was definitely nearer 25km. But, it doesn’t matter! 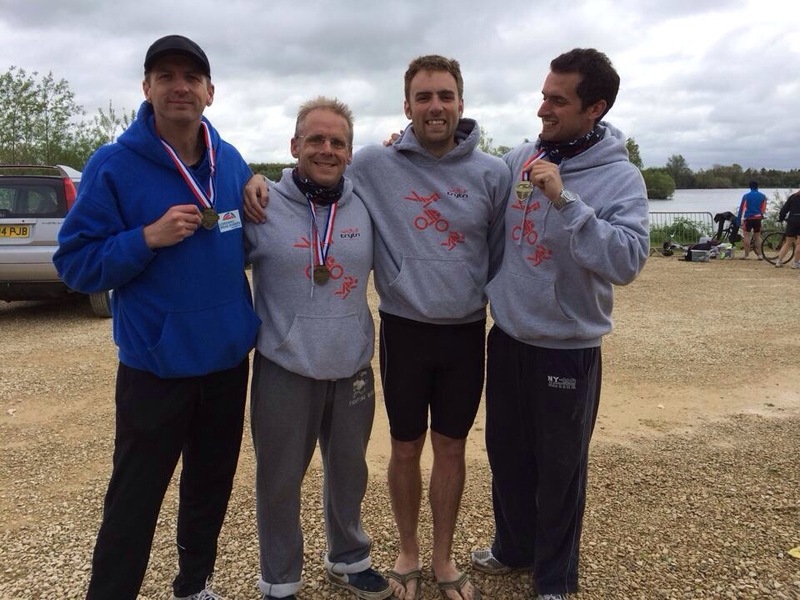 It’s all part of the relaxed atmosphere that Try Tri are renowned for. To ease the queues, registration was available on Saturday evening or Sunday morning. As Denise was away for the weekend and the boys were having a sleepover at their Grandparents, I took the opportunity to head up to HOWSC after dropping them off on Saturday evening. It also gave me the opportunity to check out the facility and, most importantly, the bike course. I did that recce before registration and was pleased that the course was fairly flat (or at least, so it felt in the car!) I took a time-lapse video of the course and later shared it on Facebook for anyone that wasn’t aware of the course. Having checked out the bike route, I returned to HOWSC and on arrival, I saw Charli who was the Race Director for the event and had a chat. I then went to look at the swim entry and exit. On my way there, Try Tri’s MD Chris and Ben drove up and Ben offered to give me a guided tour. How’s that for service? We walked up to transition and Ben explained T1 entry/exit and T2 entry/exit. Everything seemed quite straightforward. Shortly afterwards, fellow LRR and parkrunners Stuart and Tamsyn turned up and we all chatted for a while before heading for home. The evening was then spent preparing for the event. Running is a very simple sport. T-shirt, shorts and running shoes are all that’s needed. For triathlon, it’s a whole different story. The bike needed checking, tyres checking, all the equipment collected and packed and then loaded into the car with the bike. I have a checklist to make sure I don’t forget anything. At shortly after 9pm, I went to bed. I’d set my alarm for 5am with the intention of arriving at HOWSC for about 6:30am. My body clock woke me up hourly from 2am and I eventually decided to get out of bed at 4:45am, showered and got ready. I was in the car by 5:25am and arrived back at HOWSC at 6am just after the car park opened. There were a few others there but it was pitch black. A few wise people had head torches. Wish I’d thought of that. Setting up for transition in the dark was a little challenging. Fortunately, I was the first to rack up for the sprint distance which meant I had a prime spot at the T1 exit of the rack. Although it didn’t really give much of an advantage, it did mean that I had a little extra space at the end of the rack and also could find my bike quite easily. Having got everything set out by 6:20am, I was then twiddling my fingers for a while. Having said that, I’d much rather do that than be rushed to get to the venue and set up with the hussle of lots of others doing the same. Having taken a comfort break, it was time to think about getting my wetsuit on. This is always a little difficult to time as once it’s on, getting it off again is a pain particularly for any toilet breaks before the start. It was quite chilly and I was glad that I’d taken my arm warmers. Teri and her family arrived and she started setting up her bike. I spotted a few other familiar, and mostly friendly, faces including some that I’d seen at other recent triathlons. Before long, it was time to head to the race briefing which was delivered by Charli. Everything seemed pretty straightforward still although I was a little confused about the run route and how many laps but hoped that this would become clear once we were doing it. We walked back to the swim start area to collect our timing chips before getting into the water. Everyone shared ‘good luck’ messages and we waded in. The slope down to the water was a little sleep and slippy. Once in, the bottom of the lake was an interesting combination of pebbles, mud and weed. At one point, I waded through a ‘bush’ of weed and wasn’t sure I’d make it out of the other side. Fortunately I did just in time for the rather unexpected 3, 2, 1, go which caught some unawares. As a single lap 750m swim course, the good news was that I wasn’t going to be lapped (unless I was really slow and the novices caught me up!) I managed to do a half-decent swim for me and wasn’t left dragging behind. Well, to be honest, I’m not sure how many were behind me. I was definitely in the last 3/4 of the swimmers but did manage to pass a few people on the final straight. Getting out of the lake might have been more of a challenge had Chris not offered a helping hand (and some words of encouragement). The route to T1 was a little challenging with a mini-hill to negotiate which was covered in (quite slippy) matting. Once down the other side, it was time to run, barefoot into transition to get on the bike for the cycle leg. I found my bike easily due to its obvious position and removed my wetsuit (quite quickly for me), put my helmet on, gloves, race number (on belt) and cycling shoes. Transition wasn’t particularly quick and took me about 1 minute 50 seconds. I ran to the mount line with my cycle shoes on, never easy and prepared to get on. I struggled to clip in and had to try again. Fortunately, the 2nd time, I was good to go and started peddling. My cycle leg went really well for almost all of the first lap. I was really pleased that I’d familiarised myself with the course before hand and knew what to expect. Fortunately, the roads were relatively quiet and I made good progress overtaking a handful of competitors on the first lap. After about 6 miles, my bike started to get sluggish and I couldn’t work out why. I carried on regardless. I keep looking at the rear tyre and things didn’t look right. I had a puncture. For a short while, I hoped that I could carry on without stopping but the tyre was completely flat. I had to stop. Fortunately. the verge was quite wide and it gave me plenty of space to stop and contemplate what to do next. For a moment, I considered stopping and walking back to transition. However, I wanted to earn myself a medal for completing the triathlon so set to work to replace the inner tube. I was really glad that I’d done the RideRide Cycle Maintenance course. However, it still look me severa minutes to remove the wheel, remove the inner tube, replace it and then put the wheel back on. It was then time to pump the tyre up which with a small pump was impossible. I managed to inflate it to about 60psi (of the recommended 145psi!) and then set off. Within seconds, it was clear that something was wrong with the mech so I stopped, sorted that out, and then set off again. In total it took me 9 minutes and 45 seconds to sort out the puncture. Any chance of a performance I’d be proud of had slipped away. A very clear indication of a break for 9:45! I set off to complete the next lap, a little worried that I’d get another puncture. I didn’t have a spare inner tube. The 2nd lap was uneventful and I managed to pass several of the novice competitors who were already out on the bike course for their 1 lap. As I turned back onto the A338, I saw Teri ahead in her distinctive GE triathlon suit. As I passed, I wished her well and headed for T2. This went fairly smoothly. 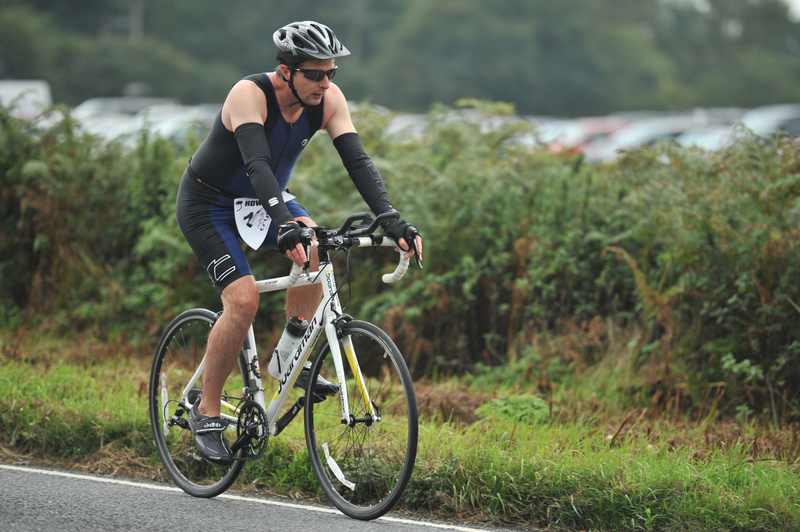 I was really wary of getting cramp as I had done in both previous triathlons. Fortunately, I’d been hydrating regularly during the cycle with High 5 Zero electrolyte tablets in water. These must have done the trick as there wasn’t even the slightest hint of a cramp at any stage of the triathlon. Teri’s T2 was much quicker. This could have been down to her cycling in her running shoes. She exited transition looking strong. I was plodding if I’m honest and was a little despondent about the puncture and its effect on my performance. However, I carried on and keep a steady, if relatively slow, pace. The run course was mainly on grass and had some very mild undulations. What I mean to say there is that it was flat. The elevation profile wouldn’t have been any worse than Lakeside and its elevation shared some similarities. I was still a little confused by the number of laps we had to run and was glad that I had my Garmin to tell me the distance I’d run. Had I not had it on, I might have run a shorter course (as others did end up doing). If there’s one thing that needs more clarification for next year’s event, it’s the run course. It has to be really clear what laps need to be done. After 2 laps, it was time to head for the funnel. It was great to have an entourage of friends giving encouragement as I finished. It was also great to catch up with Steve (from RunCamp) and Nick (ex-work colleague) after the finish. In summary, it was another great Try Tri event. Super-friendly team and marshals. Great course with only a couple of niggles which would be difficult to resolve due to the venue. The only negatives were the lack of warning about the swim start and the ‘confusion’ over the run course. WIth regards my performance, I was happy with how well I’d done. 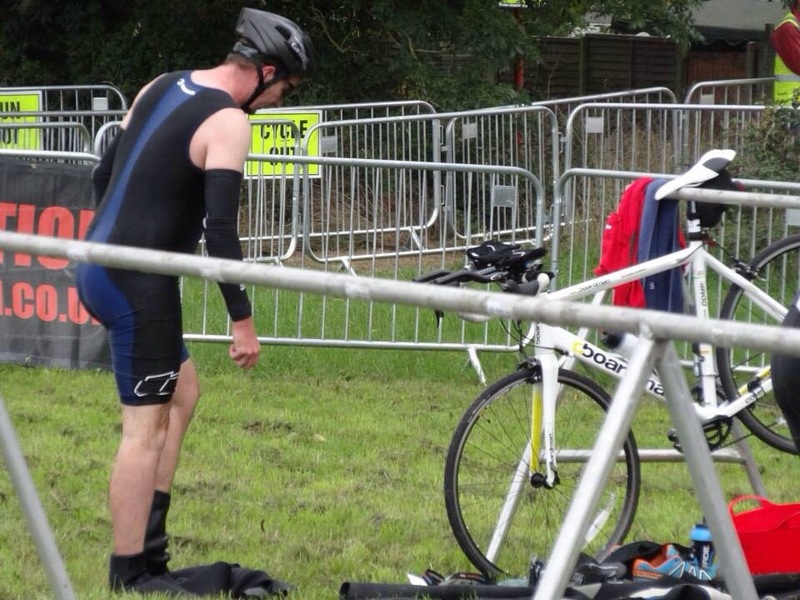 I was particularly happy with the swim and the cycle (apart from the puncture and its effect on my time). The run was a little poor and I know that I need to work on this as I struggle to reach a decent pace after the other two disciplines. Great performances from Roelie, James, Teri, Tamsyn, Stuart, Steve, Nick and many others. I’ll add the official stats and any photos later. OK, here are the stats. I came 34th out of 42 finishers. Had I not got a puncture, things would have looked a little different with a 00:54:47 cycle making the time for the whole event 1:47:52 which would have put me in 25th place which would have been very respectable I’d say. Ultimately, the puncture lost me 9 places. However, I’m still happy to complete the event and have a great time doing so. In reality, much of the issue is down to technique and although I had a SwimSmooth video analysis earlier in the year (February 2013) and I managed to make minor tweaks, I’ve not really improved enough given the number of months that have gone by. In parallel to this, I’ve friends who have improved their swimming efficiency and technique by attending regular lessons, attending SwimFit sessions, etc, etc. At roughly the same time that I did the SwimSmooth session, I contacted Southampton Triathlon Club with the intention of signing up and attending their coached swim sessions. However, back then (February), I’d not done a triathlon and was worried that my abilities in the pool would make me the worst swimmer hence I never got around to attending a trial session. Instead, I continued to make little progress in the pool or, subsequently, in the lake when I started open water swimming. The latter really helped with my endurance (being able to swim 350 metres without stopping every 25 metres is quite a feat at first, let alone doing that for several laps. 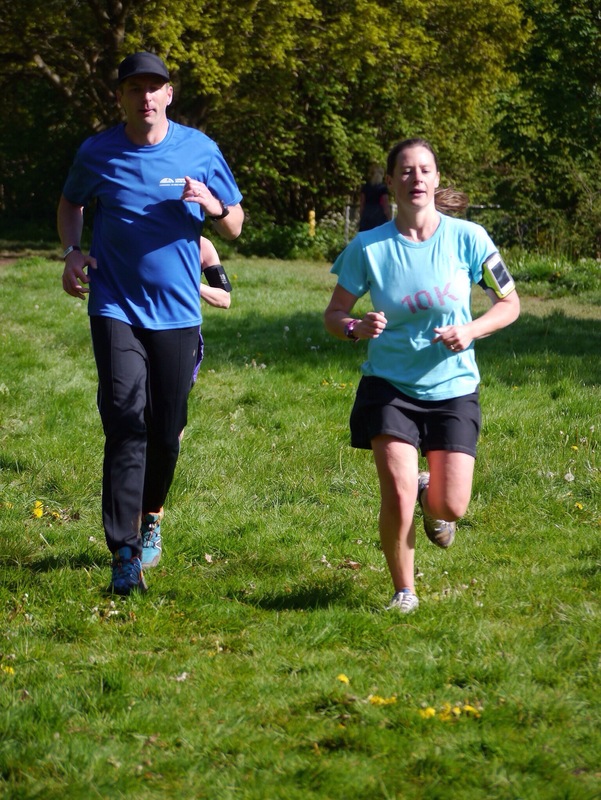 Last week, fellow parkrunner, parkrun Event Director, fellow Lordshill Road Runner, fellow lake swimmer and friend, Tamsyn, posted a FB message asking for people’s opinion on Southampton Tri Club vs Tri Team Wessex. This started a good conversation about the clubs, their coaching and what level you had to be to feel worthy of being involved. This got me thinking that I really needed to do something if I want to improve my technique in the pool and open water so I emailed Julian, the club’s chairman, reintroduced myself, checked my diary and decided to go to a session at the Quays. However, in recent months, Denise has been diving at the Quays weekly and I’ve been taking Daniel diving weekly too. The location and proximity to home was really not a barrier at all. Compared to running club membership, £22 a month sounds a lot (LRR yearly membership is £25 for comparison). However, for that £22, you’re getting the opportunity for several coached swim sessions each week. Because some of these clash with other things I do and a couple are too far away, I’m likely to do 2 per week, but that’s still at least 8 sessions per month which works out at £2,75 per session. That’s a bargain. Clearly, you’ve got to find sessions that fit in with your own schedule but 2 of them do for me, so it makes a great deal of sense to join and make the most of those two opportunities per week. Anyway, enough of the logic behind my decision and a little more about what happened. I arrived at the Quays at about 7:40pm, nipped into the changing rooms and got ready. As I was putting my gear into a locker, Julian arrived so I chatted with him. Shortly into our conversation, Tom, another newbie turned up and we got several questions answered. We were also told that if we couldn’t do the required number of lengths/laps, that was fine. Do the best we could was the advice. For the warmup, I set off first. No pressure then!! As we swam, Steve watched us and took notes (or might have been completing his shopping list?!) I got to the end of it and didn’t feel as if I had to call it a day at that point. Phew! I wasn’t the fastest in the lane but then nor was I the slowest. At the end of the warmup, Steve offered a couple of tips for improving my technique and then we started doing some drills to help start ironing out issues with our existing technique. The drills were tough at times and I’m struggling to remember some of them. The first was a kicking drill with the pullbuoy held in front with two hands. This was tough as it’s amazing how little the kick (or at least my kick) contributes to propulsion. I found it a little difficult breathing during this drill as you have to lift your head up. The next drill was called, by Steve at least, the chicken arm drill and enforced keeping your arm close to the body (similar to the zipper drill) but with a high elbow recovery. I didn’t find this drill too bad. I didn’t feel like a chicken, but I got the idea. Another drill was one where you had both hands on the pull buoy ahead of you and had to take alternate strokes but always returning to having both hands on the pull buoy (the swim catch up drill I believe). By this point, I was starting to get overwhelmed with all the information we were being given and my brain, and subsequent technique, turned to mush! We then put what we’d learned into practice with some freestyle and Steve gave more advice or reiterated where we’d forgotten something. One of the things I’ve always struggled with is the high elbow catch and he suggested a hand entry technique which would make it difficult not to get it right. I think he was right. Our last water-born adventure was a game of SWOLF. First of all, we had to prove we could swim fast… or at least faster than our slow pace. I think I managed to convince Steve that the negligible speed improvement was still an improvement (or maybe he was just being kind). Having got through 50m of swimming fast (er), it was time to swim 50m and count our strokes. We each set off 5 seconds after each other and off we went. For the 50m, I managed to remember to count and came back and gave my score which was added to the time that I’d taken to swim the distance. I can’t remember what my score was to be honest!! We were then given the challenge of improving out SWOLF handicap by 2. I put in an extra effort and, although I lost count on the first length (and ended up doubling the number of strokes for my 2nd lap), managed to reach the target. Everyone else did, some by 10 or more. My rationale was not to overdo it. I didn’t want to be teacher’s pet!! That’s my excuse at least! Finally, it was time for the cooldown and the dreaded breaststroke!! I can’t do breaststroke. Simples! However, I did manage to get from one end of the pool to the other using something that was a distant relative of that swim stroke (and which my Garmin miraculously recognised at breaststroke. Technology, eh?!) so maybe there’s hope for me!! One length back on my back and it was time to get out of the pool. Steve was a great instructor, made us all feel at ease, offered great advice and made me feel confident that over the next 3-4 months, I should be able to improve my swimming technique. As soon as I got to my PC this morning, I signed up as a member of Southampton Tri Club and I’m looking forward to trying out their Wednesday morning session at Fleming Park tomorrow morning from, wait for this, 5:45am! Yes, I know. It’s a crazy time but then training for multi-sports is pretty crazy at times. It’s 3:40am and I’ve been awake for an hour. I have to get up in about 40 minutes to have breakfast and them head off to Chandlers Ford for this year’s Valley Leisure Triathlon. This event starts at Andover Leisure Centre with a 600 metre swim followed by a 30km bike ride to Romsey Rapids. After that, there’s a 7.5km run to Knightwood Leisure Centre in Chandlers Ford. Those are the 3 leisure centres managed by Valley Leisure hence the name. The reason for the early start is that I’m meeting Chris at Knightwood and then we’ll take one car up to Andover for registration and racking. Registration closes at 7am and we want to arrive well in advance of then. Giving a total time of 2:10 (2 hours 10 minutes). It’s ambitious but hopefully do-able. There’s scope for the cycle to be worse than my estimate but hopefully I can hold it all together and find some time in the early stages. My realistic target is 2:20. I got up shortly after starting this post and had breakfast; porridge with sliced banana and sweetener. This was a slight departure from my normal breakfast but was nice and I’ll definitely have it again. As all my bags and bike were already in the car, it was just a case of washing, getting dressed and heading out to the car which I did earlier than planned at 4:45am. Yes, you read that right. Why was I doing this?? I met Chris in Chandlers Ford where we transferred his bike and gear into my car before heading up to Andover. The journey there was simple and we arrived at about 5:45am and recced the site before heading into registration. There was ample racking for the bikes so once we’d returned to the car to get the bikes we set up at the racks close to exit of T1. As the event was held over multiple venues, it took a little thought as to which gear had to be where and at that time of the morning, it was a bit of a challenge. Fortunately, I’d separated my gear into a bag per venue anyway and this helped. Once our bikes were racked and our transition areas ready, we went off to find the toilets (there seemed an inadequate number but at no time did queues seem excessive). I also dumped some valuables in the locker and before we knew it, it was time to head off for the race briefing in the cafe which was delivered by Ben. As soon as the briefing was over, Chris and the rest of waves 1 and 2 were off to the pool to get their timing chips ready for the 7am and 7:20am wave starts. I found a seat and relaxed before deciding to go and watch the swim. I timed it well as the first wave entered the pool as soon as I’d arrived. The pool didn’t look 25m long as I looked down on it but I was sure that it’d look quite different from one end. After a little over 8 minutes, the first swimmer exited the pool. That was quick. The last swimmer took between 15 and 16 minutes. Quite a difference in abilities. Chris was up next and he was out of the water in under 11 minutes which was his target. I chatted to a couple of other participants while I waited until 7:40am to head down to poolside. Our wave started early. I was in lane 4 with 2 others. I’d be 2nd to set off and as the marshal counted down from 5, I submerged myself and got ready to go. The first few laps went well. I was able to count each lap and concentrated on my form. I was fairly happy with how I was doing. By about the 10th lap, I was lapped by the first swimmer in our wave and by about lap 18, the swimmer who’d set off 20 seconds behind me overtook me. I wasn’t too concerned as I’d lost count of how many laps I’d done several laps before. It really was too much to think about with counting laps, trying to maintain an efficient (as I get) swimming form, keep an eye on the others in the lane etc. I’m fairly sure I swam 2 extra lengths as my Garmin recorded 425m and one of the lengths was twice as long as I’d expect. Not the end of the world but could have added an extra minute to my swim time. I got out of the pool, removed my goggles and left my cap as instructed. As I looked at my Garmin, it showed 16 minutes which could back up the fact I think I did 2 extra lengths. Getting to T1 meant carefully negotiating a set of stairs and running between buildings barefoot. This added about another minute to my time I’d estimate. My experience in T1 was good. I just had to put my cycling gloves on, my helmet, cycle shoes and race belt and in rack my bike. All went smoothly. I greatly appreciated the short distance I had to run in my cycle shoes across the hall floor and then pavement to the mount line. Shortly after the start of the bike section, we had to negotiate a roundabout. Fortunately as it was about 8:15am on a Sunday morning, it was quiet. I was lucky with traffic lights and headed off for the 30km route from Andover, through Stockbridge to Romsey. The route was undulating with a couple of hills to climb and descents to enjoy. Having had two longer and more challenging rides out with Neil, the route didn’t seem too difficult. There was one section that was a steep incline but fortunately it was quite short. It was a killer though. On some stretches of the route, there were some very narrow lanes and I was quite glad not to meet any oncoming traffic. Before long (well, over an hour), I was on the outskirts of Romsey. Getting there had meant passing through some lovely villages and hamlets, not that I had a great deal of time to enjoy the scenery. There were some lovely views in the sunshine. A beautiful part of the country. As I hit Romsey, I started working out how far off my ambitious target I was. Probably 2-3 minutes. I’d lost a couple of minutes on the swim and probably a minute or so on the cycle ride. I wasn’t disappointed. When I passed Romsey Station, my left quad muscle cramped up. I was in pain and the marshal at the lights there called out to ask if I was ok. 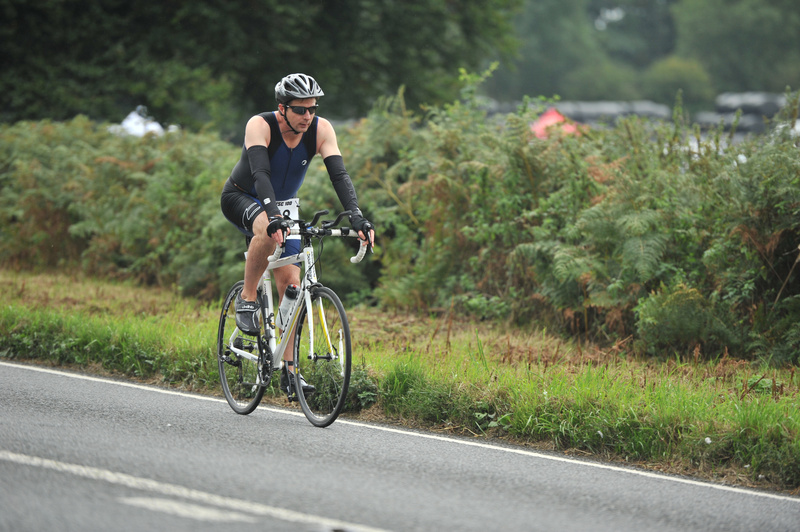 I cycled through the pain and started to worry about cramping up in T2. I hit red and two sets of lights which lost me about 1 minute. Having left Romsey Rapids via a little path from the field behind the leisure centre, it was necessary to cross a couple of roads. There was little traffic and I didn’t have any issues. I could feel my quads and was a little worried that they may start to cramp. I wasn’t wrong. About a mile into the run, the pain had become unbearable and I had to stop. I’d started ascending a hill and it ached to standstill, to walk or run. I started to think about pulling out but knew that I had to get to the finish anyway so tried to run. It was more of a straight-legged hobble and it wasn’t long before I stopped again. I tried to hold onto a lamppost and stretch to ease the pain but nothing seemed to work. I had to try and run through it. Each time I ran, the pain eased a little before getting worse again. This dictated a run/walk strategy which was really disappointing as my optimistic target slipped away! In reality it had slipped away before T2. Now my realistic goal looked in jeopardy. As I turned left from North Baddesely towards Chandlers Ford, the route got flatter. I was still struggling with cramps but eased my pace determined to get to the finish and run as much of it as I could. All of a sudden Big Dave Hawkins from ERC was at my shoulder asking if I wanted some company. He was out on a 10 mile run and nearing the end of it. The company was much appreciated. After a few minutes, a short distance ahead, I could see a Romsey Road Runners top. It was Chris. He’d finished a while before (probably an hour) and had come to help me to the finish. Whether he knew I was struggling or not before, I’m not sure but seeing him made me sure that I’d finish. My pace increased and we headed for ‘home’. Chris explained the rest of the route so I knew what to expect. It was really helpful although I didn’t appreciate hearing about the incline to the finish!! Before long, we were turning into Knightwood Leisure Centre and I could see the finish. Chris dropped back and I increased my pace. It seemed everyone at the finish was shouting my name and giving me encouragement! I crossed the line feeling very glad that I’d not given up. I saw Barbara and Ian Boshier and Yvonne and needed to lie down once I’d had my timing chip removed, been presented with my medal and had my photo taken. Chris brought over some very welcomed water and I drank that and rehydrated. The encouragement from Big Dave, Chris, Barbara, Ian and Yvonne was much appreciated and it was great to have them there. I finished in 2:20:37. 37 seconds outside my realistic target which given my issues on the run wasn’t too much of a disappointment. I’m really glad I finished and completed my 2nd triathlon. My T1 was really good. Everything else was less so!! I finished in 79th position out of 101 finishers. Had my run not fallen apart, I’d probably have finished 15 places sooner. The event itself was very well organised. It’s great to see the friendly team of Ben, Charli and Chris and they’re always happy to chat. Logistically, the event is well organised given the 3 venues. However, having to travel from Chandlers Ford back to Andover and Romsey is a pain and adds an extra 60-90 minutes to the day. Add to that the early start and it’s almost 7 hours from start to finish. 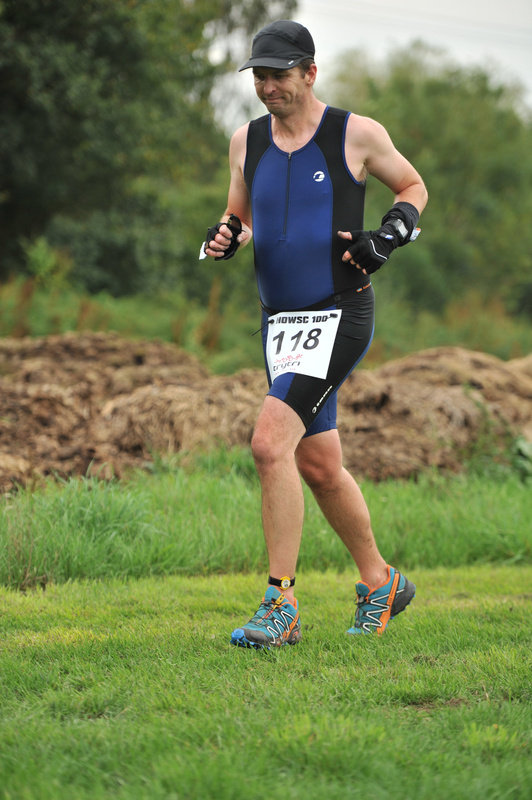 Eastleigh Open Water Tri with its one venue was much shorter and easier. Also, the spectator interaction was great at Lakeside. 3 weeks until my next Tri, HOWSC Tri. 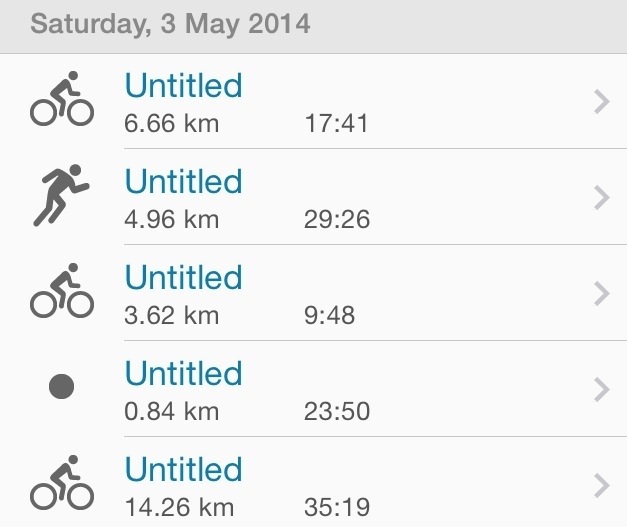 That is a sprint (750m lake swim, 20km cycle and 5km run). Between now and then I need to make several improvements and work out how to reduce the likelihood of cramps which have affected my triathlons so far.